One of my proudest achievements so far, as a low sodium cook, has been creating a recipe for Faux Miso-Marinated Cod. If you have never experienced the real thing, a two-day, miso/sake/mirin bath gives this already fatty fish a sweet and silky flavor that really does melt in your mouth. I personally believe it is one of the greatest ways to prepare fish. The texture is satisfying and the taste overcomes any remnants of fishy-ness that might displease your palate. 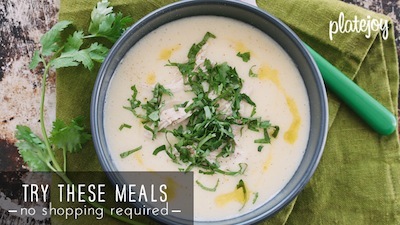 It is an utterly decadent dish and as an added bonus, incredibly easy to cook. The problem? Miso contains over 700mg of sodium per tablespoon and the thick, fermented flavor and dark, mahogany color it provides is essential to mastering this meal. But I wasn’t going to let that minor detail stop me from enjoying this dish and I was determined to find a way to mimic the taste of the miso without the salt. So Boy and I put on our Chris Kimball thinking caps and created an America’s Test Kitchen of our very own to see if a low sodium version of Nobu’s famous Miso-Marinated Cod was possible. And in the other corner, we prepared a second, 3 ounce cut that waded in a bath of sake, sugar, and mirin. I have to admit, this piece of fish looked pretty sad in comparison to the Boy’s more seductive slice and I anxiously stared at the gaggle of sauces and spices we had to see if there was anything I could add to better match my pale protein to it’s more handsome relative. Then, suddenly, a moment of pure sensory genius. Boy began scooping out the miso paste and with a quick sniff to the nose, I had a moment of olafactory deja vu. The miso had such a familiar aroma – sweet and musky – I knew I recognized it, but from what? I gazed back at my collection of sauces and there it was. MOLASSES. Dark, syrupy, and bitter sweet, it was the perfect substitute. The end result was a true success, better than I could have ever imagined. Although the two cods would not pass a blind taste test, the faux version came pretty close to the original. The molasses helped balance the sweetness of the mirin and it gave the cod the customary, rich color that one would expect. And again, as you will see, the recipe is as simple as it is delicious. To serve, I suggest some steamed brown rice with either sauteed leeks or wild mushrooms and garlic. Anything earthy will pair nicely with the sweetness of the cod. And do invite over friends. They will forever be impressed and you there’s no need to reveal how easy it was. 1. Heat sake and mirin in a pot over medium flame and simmer for 30 minutes. 2. Remove from heat and add the molasses and sugar and stir until it is dissolved. Allow the mixture to cool. 3. Cut black cod into 6 equal pieces and place in a shallow dish, large enough so that all of the pieces of cod can lay flat. 4. Pour half of the cooled miso marinade into the dish, add cod, and then pour remaining marinade on top. Cover with plastic wrap and refrigerate for 24 hours to 2 days. Turn the fish every so often so that they get an even coating. 5. Preheat broiler on high. 6. 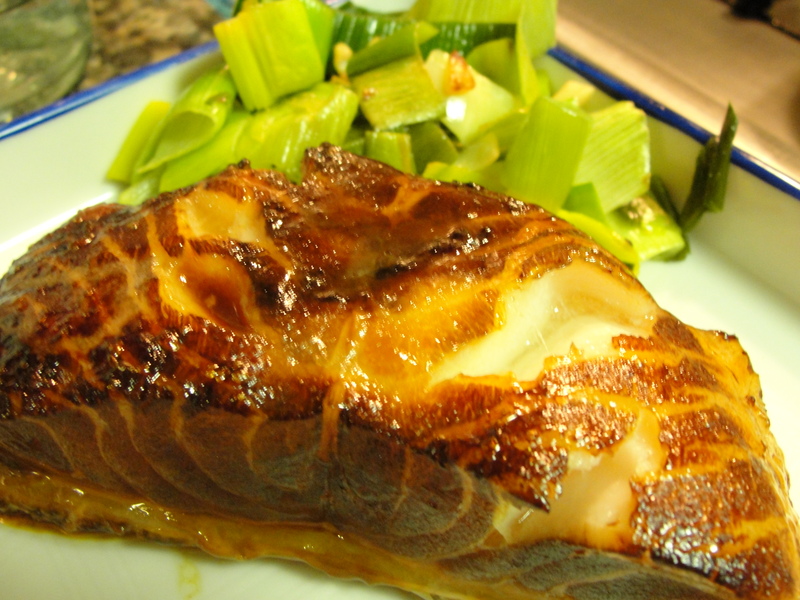 When hot, remove cod from marinade and place on a baking sheet on the bottom rack of oven. Broil until caramelized, about 10 minutes. Turn cod over and broil until fish flakes easily, about 3 minutes more. 7. Seriously. That’s the whole recipe. Amazing, right? Now have a glass of wine and admire your work. Chow on. I can hardly wait to try this recipe. Black Cod with Miso is MY FAVORITE THING to eat. 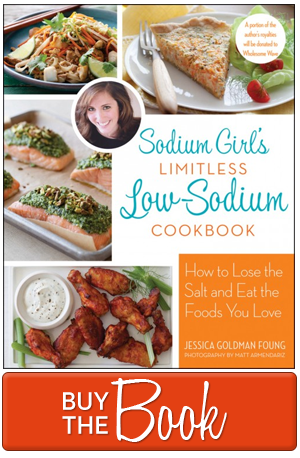 Now I ha e to be a low sodium girl too and I thought my days of this dish were over. Thank you, thank you, thank you!! !